1917. as war rages in Europe, the F.B.I. are hunting the killer of Charlie Chaplin. 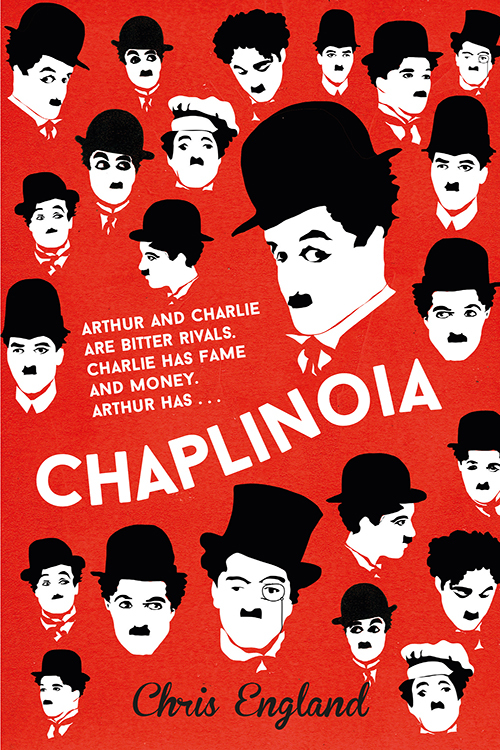 Chaplin’s career has criss-crossed with the rise of film to make him the first global star. Chaplin-fever rages: Charlie dolls, lookalike contests, even the tramps are copying the look immortalised in ‘The Tramp’. There are Chaplins everywhere. English comedian Arthur Dandoe is on the run, sick with his own kind of Chaplin-fever. His bitter rivalry with Chaplin, stretching back to their early days in music hall, has spun out of control. It’s lost him his career, his family, now it could lose him his life. Luckily for Arthur, there’s a war to hide in. With East and West Coast studios slugging it out, the early days of the flickers are a dirty battleground, where bribing, spying, and outright fakery forge the careers of many a later legend. But how long can Arthur hide? Especially with the FBI after him, offering a deal that goes against everything he ever stood for. CHAPLINOIA s is a tale where history and mystery collide against a backdrop of bogus cowboys, fake news and killer ostriches. And it’s all true. Almost. Chris England’s previous writing includes the stage plays (and subsequent films) An Evening With Gary Lineker and Breakfast With Jonny Wilkinson, and the book Balham to Bollywood (a Radio 4 Book of the Week). In addition, he writes the radio shows 7 Day Sunday and 7 Day Saturday for BBC Radio FiveLive.